Calderas form from the catastrophic eruption of large amounts of felsic lava and ash. Emptying of the magma chamber and subsequent collapse of the overlying volcanic edifice forms a ring-shaped caldera depression up to several kilometers in diameter. 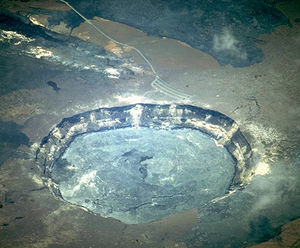 The edges of the underlying magma chamber are roughly marked by a ring fracture zone that acts as a conduit for ongoing volcanism and hydrothermal activity. Calderas are capable of expelling large amounts of volcanic material in a single eruptive event, leaving behind regionally extensive ash fall deposits. For example, the Bishop Tuff, deposited during the eruption of the Long Valley Caldera 767,100 ± 900 years ago, covers a 2,200 square-kilometer region of the southwestern United States. This page was last modified on 11 April 2017, at 13:59.